Caramel Apple Pie Bars make the perfect fall treat. They have everything you love about classic apple pie but so much easier and better in bar form. It’s pie season everywhere you look these days and apple pie is my husband’s favorite of them all. As much as I love pie, I rarely make them because of the amount of time involved. Bars are the next best thing because they are so much easier to make. Plus, the squares make them easier for sharing so they’re perfect for taking along to a party or a potluck. 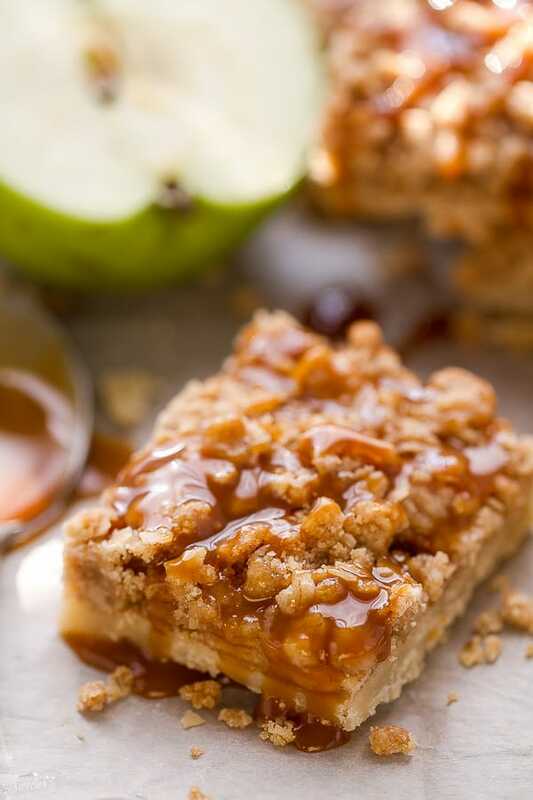 These Caramel Apple Pie Bars have everything you love about apple pie without the hassle of making or rolling out pie dough. There are a few steps involved but nothing complicated. I promise that they are a cinch to make and totally worth it. They start off with a buttery shortbread crust covered with gooey cinnamon apples. Next is the generous layer of brown sugary oat streusel with a drizzle of homemade caramel sauce. They are completely irresistible and with the amount of time you saved, you’ll love these even better than a classic apple pie! 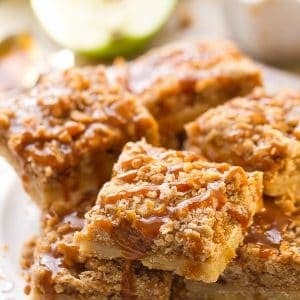 So next time you’re in the mood for a sweet treat, bake up some of these scrumptious apple pie bars, and I promise you won’t be disappointed! They’re perfect for sharing too! Caramel Apple Pie Bars have everything you love about classic apple pie but so much easier and better in bar form. Preheat oven to 350°F. Line an 8-inch baking pan with aluminum foil or parchment paper, leaving enough overhang on all sides for easier removal of bars. Set aside. Make the crust: In a medium bowl, combine the melted butter, sugar, vanilla, and salt together. Stir in flour and mix until everything is combined. Press the mixture evenly into the prepared baking pan. Bake for 8-12 minutes until lightly golden. Meanwhile prepare the filling and streusel. Make the apple filling: In a large bowl, place the sliced apples, flour, sugar, cinnamon, and nutmeg together and gently toss until the apples are evenly coated. Set aside. Make the streusel: In a medium bowl, whisk the flour, brown sugar and cinnamon together. Stir in oats. Using a pastry cutter, two forks or clean hands, cut in the chilled butter until the mixture resembles coarse crumbs. Set aside. Remove the crust from the oven. Layer the apple filling evenly on top of the warm crust, pressing them down to fit. 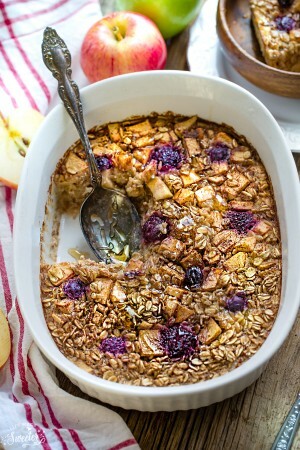 Sprinkle the streusel topping evenly over the apples and bake for 30–35 minutes or until the streusel is golden brown. Remove from the oven and allow to cool completely. To speed up chilling time, place in refrigerator for 2 hours or overnight. Remove bars from pan using the overhang from the foil or parchment to lift. Cut into bars. 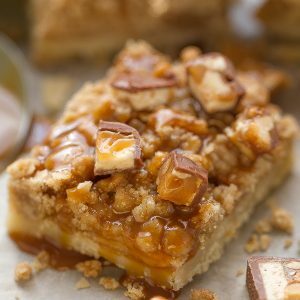 Drizzle each bar with salted caramel sauce. Store baked cake in an airtight container at room temperature for up to 2 days. I love the caramel and apple flavors! These bars look SO good, Kelly! 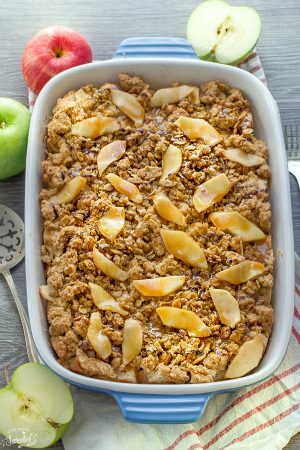 These apple pie bars look amazing, perfect for these cool fall mornings! I love that you used so many of my favorite ingredients in these bars! They look perfect! Hope you’re having a great week! Loving these bars! Pinning and putting it on my list. Oh wow, what a delightful combination of flavors! The caramel sauce on top of the streusel – GAH! All this deliciousness is leaving me drooling all over the place! Scrumptious looking bars, Kelly! Have a wonderful week! Oh boy do these bars look tempting…perfect in my book! The streusel topping sounds wonderful with the caramel sauce! I love the apple pie flavors! These bars look delicious, Kelly! This is a lovely. I’m totally in love with the flavor and texture combination 🙂 And the streusel topping is a must. These bars look SO good, Kelly! Love the caramel sauce and streusel! Here it is, barely 6 a.m., and these bars have me drooling! I wish I had one right now to enjoy with my coffee. I am loving this recipe! Thanks for the great share! Swoon! Aaw, I’m so glad you like it, thanks so much Kristi and hope you have a wonderful week! Well doesn’t this look tasty!?! I want a slice to join me for tea right now. The glaze and stresusel on this are out of control girl! I’m just going to sit here and stare at the pictures because I’m incapable of doing anything else – beautiful! So glad these are easier than making pie. They looks SO wonderful! These bars look so delicious and that topping!! !